Take two subway stops on the 2 or 3 train from Borough Hall to Nevins Street. Or you could hop over one subway stop on the 4 or 5 train. Or you could even take a seven-tenths of a mile walk down Fulton from Remsen Street to DeKalb Ave.
That’s all that separates the campuses of St. Francis Brooklyn and LIU Brooklyn, right in the middle of The Big Apple’s most populous borough. When their women’s basketball teams meet head to head on the hardwood, not much separates them there either. The annual “Battle of Brooklyn” showdown is always one of the most eagerly anticipated dates on the NEC basketball calendar, and on Monday afternoon, the 2019 ‘Battle’ will have arrived. 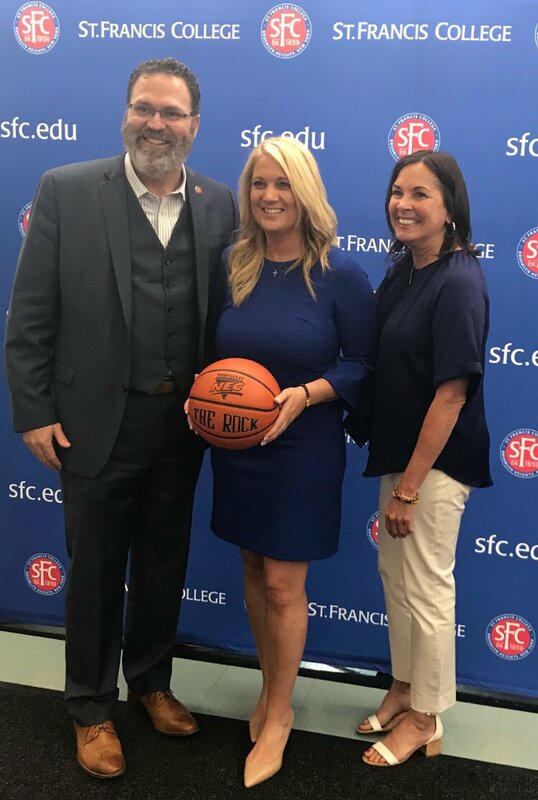 To try and illustrate the charm of this series and just how unique the rivalry is, former LIU Brooklyn head coach Gail Striegler once mentioned to me how she found it pretty wild that she would go to church on Sundays and routinely run into players and team personnel from St. Francis Brooklyn. Having grown up in Arkansas, and having the experience of playing and coaching in many major cities across the country, she never saw anything quite like it, where the ‘rivals’ were literally right there in your own backyard and walking the same area as you. Back in January of 2016, while Winter Storm Jonas was blanketing the northeast with several feet of snow, causing a state of emergency in New York, and wreaking havoc on the college basketball schedule, former Terrier head coach John Thurston and his Terriers trekked the seven tenths of a mile, in the snow, to make it to the Steinberg Wellness Center to play their game as scheduled. I mean, they were right down the street, the refs were there anyway, and they still had the electricity and heat working in the gym…so why not? After you look at the close proximity of the two schools, then you have to factor in the history. Each team has won a Northeast Conference championship, but each team has also had its most successful regular season spoiled by the other. In 2007 the LIU Brooklyn Blackbirds finished 15-3 in conference play and tied for the regular season championship. By virtue of a tiebreaker, the LIU Brooklyn Blackbirds earned the #1 seed in the tournament for the first (and only) time in their program’s history. Lying in wait for them in the first round were their rivals from down the street in the #8 seeded St. Francis Brooklyn Terriers. The Terriers raced out to a 21-5 lead and never looked back, pulling off an incredible 61-51 upset. It was the first (any only) time in Northeast Conference history that a #8 seed upset a #1 seed in the NEC Tournament. Then, just last year, LIU Brooklyn was finally able to hand the Terriers a receipt. While the Terriers were enjoying their highest ever seeding in the NEC Tournament at #3, the 6 seeded Blackbirds pulled off a 59-56 upset of their own in the first round. Christine Cunningham, Christine Taps, Carolyn Harvey, Kim MacMillan, Tamika Dudley, Valarie Nainima, Ashley Palmer, and Leah Fechko are players who have earned 1st team All-NEC honors while also winning a Battle of Brooklyn MVP in their careers. LIU’s Dudley and Nainima are the only players to win the BOB MVP & pick up a NEC Player of the Award. Watch the 26th annual Battle of Brooklyn on Monday, January 21st at 12pm ET on ESPN3. *NEC UNBEATENS: Only two teams remain among the ranks of the unbeaten after two full weekends of conference play. Robert Morris and Sacred Heart both stand atop the league with perfect 4-0 records. Robert Morris, the 2019 NEC pre-season favorite, has jetted out to a 4-0 start for the second straight year and for the third time in the last four. The Colonials have been sharp on both ends of the court. They have maintained their regular defensive standards, leading the league in scoring defense and only allowing an average of 50 points per game over their first four conference outings. RMU has also forced an average of 20.5 turnovers per game over their first four and have limited league opponents to 30% shooting. However, in addition to their usual defensive dominance, the Colonials are now putting up strong numbers on the offensive side of the ball as well. Four of RMU’s top five scoring games of the season have come against NEC teams. They have limited their turnovers and shot at an average of over 40%. Don’t look now, but RMU has won each of their first four conference games by double-figures for the first time since 2009-10, and they boast a ridiculous 26.3 point average margin of victory. Robert Morris will look to continue their run as their road trip continues next weekend for games at Bryant and Central Connecticut. The Sacred Heart Pioneers find themselves at 4-0 in NEC play for the first time since 2011-12. The significance of that season is that back in 2011-12 the Pioneers started 7-0, finished 15-3, and ended up cutting down the nets as NEC Champion at season’s end, their last championship season to date. The 4-0 mark didn’t come easy, as Sacred Heart was put to the test back on Monday night against the Bryant Bulldogs. Playing down a starter and with a short bench due to illness, the Pioneers held a halftime lead before struggling to find their shooting touch in the second half, allowing the Bulldogs to get back into the game. The game would come down to the final seconds, with Bryant taking a 48-47 lead on a Haley Connors three with 0:19 seconds left. After drawing a foul with nine seconds to spare, SHU grad student Katherine Haines stepped up to the charity stripe and knocked in a couple of clutch free throws to give the Pioneers a slim one point lead. After Sacred Heart used two fouls to give, leaving Bryant with just one second remaining, SHU grad student Erin Storck swatted away a Connors buzzer beater attempt to seal the win. In the post-game interview on the Front Row broadcast, head coach Jess Mannetti beamed with pride at the resilience of her team, “I could not be more proud of the effort of this group tonight, it was outstanding.” The Pioneers will next travel to Brooklyn to meet the Terriers on Saturday before returning home to take on Wagner for the second time in four games on Monday afternoon. As for the rest of the league, St. Francis Brooklyn and Saint Francis U are both one game back of the NEC unbeatens at 3-1, while Bryant and Wagner currently stand tied for fifth place with matching 2-2 records. *HISTORIC KNIGHT: History was made in Hackensack on Saturday as the Fairleigh Dickinson Knights defeated CCSU 74-67 to record the 500th all-time victory in program history. The Knights program dates back to their inaugural season in 1977-78 when they won 16 games under coach Viktor Joganow. The Knights achieved immediate success, recording winning campaigns in 11 out of their first 14 seasons, including two Northeast Conference Championship years, in 1990 and 1992. The 1992 team, led by program greats Rita Bernert, Trina Ricketts, Felicia Griffin, and Barbara DeShields, set the program record with 23 wins in a single season. In more recent times, FDU is coming off of a 15-win season in 2018, their most overall wins in a single season in a quarter century. In his post-game remarks, Knights head coach Peter Cinella commented on the achievement, “It’s a great milestone for the university to have 500 overall wins and I’m glad we were able to do it at home against a conference team.” With the historic milestone now achieved, the Knights become the eighth active Northeast Conference women’s basketball program to reach the 500-win plateau. *COMEBACK CITY: The Bryant Bulldogs turned Emmitsburg, MD into “Comeback City” on Saturday afternoon, making up a late-game, 14-point deficit behind an incredible 29-point fourth quarter effort against Mount St. Mary’s. Having trailed the entire game, and finding themselves down by 14 points (62-48) after a Jatarrikah Settle three with 7:45 to go, the Bulldog rally started innocently enough with a Kierra Palmer three just 31 seconds later. After a Bryant turnover, the Mount took advantage with a Settle layup, but Bryant followed up with a Masey Zegarowski bucket and a Haley Connors three to get within single digits at 64-56, and force Mount into a timeout. The strategy session wouldn’t help, as coming off of the stoppage Bryant forced Mount to turn it over on four straight possessions, leading to consecutive baskets made by Brooke Bjelko, Naomi Ashley, Connors, and Sydney Holloway. Suddenly, with 2:49 left, the insurmountable deficit that Bryant was facing earlier in the fourth quarter had completely evaporated, and game was tied. The Bulldogs would outscore Mount 9-4 the rest of the way to pull off an improbable win. The Mountaineers’ four points in the last 2:49 all came from the charity stripe, as they were held without a field goal for the final 6:09 of the game, and only connected on one field goal from the Settle three with 7:45 remaining until the end. After the game, head Bryant head coach Mary Burke commented on the win, “It was a tough, gritty performance and I’m super proud in how the team fought back. I really felt that us going into a 2-2-1 press back into a man defense really helped in slowing them down. Offensively, we executed well in the half-court sets and got some great looks and offensive rebounds which was a very big key in getting the job done.” Meanwhile, in her NEC Front Row post-game interview moments after the game, Mount head coach Maria Marchesano was quite candid and direct about the defeat, “We had way too many mental mistakes late in the game. Our execution was really, really bad. Obviously (it was) a huge debacle, we were up big late, you can’t lose that game, especially at home.” To their credit, the Mount answered back in a big way just two days later, as they would roll to an 84-53 win over CCSU on Monday night, racing out to a 49-15 lead at halftime, and shooting over 50% for the entire game. Saturday afternoon marked the first time Bryant has won a game after trailing by double figures at any point in the contest since last February against Wagner, and the first time they’ve pulled out a win after trailing by double figures in the fourth quarter since December 2, 2017 against Rhode Island. On Saturday, both Robert Morris and Sacred Heart will put their perfect conference records on the line on the road. First, in Smithfield, longtime rivals Robert Morris and Bryant renew acquaintances, while in Brooklyn Heights, Sacred Heart takes on St. Francis Brooklyn. Monday features the second #AllInBallOut theme day of the year, to celebrate Dr. Martin Luther King Jr. Players and teams will be promoting unity while the NEC will be posting MLK themed content online. Monday’s slate features several MLK Day matinees, including in Brooklyn where myself and Pam Roecker will be on the call for the 26th annual “Battle of Brooklyn” game on ESPN3 at noon. THREE: Esther Castedo, FR (RMU): The Colonial freshman from Spain had two big games in her first career weekend playing in the Big Apple. On Saturday against the Terriers, Castedo came off the bench for 13 points on 5-8 shooting. Then, she set a new career high, with 17 points in reserve action against the Blackbirds. After averaging 5.8 points through the first 13 games of the season, she averaged 15 over her two days in Brooklyn, recording back to back games of double figure scoring for the first time. Castedo boasts the 8th best effective field goal percentage in the NEC at 63.3%. TWO: Jade Johnson, JR (SFBK): After a tough start on Saturday against Robert Morris (5-16 shooting, 14 points, 6 turnovers) and a cold-shooting first half in Monday night’s game against Saint Francis U (1-7 shooting), Johnson earns our #2 Star of the Week because her second-half effort against the Red Flash was just that darn good. She came out of the locker room shooting seven for eight, including a perfect 5-5 from downtown. Midway through the third quarter, Johnson scored 10 straight points for her team to take a 44-44 game with 6:38 left, and turn it into a double digit lead for the Terriers going into the fourth quarter. In the process, Johnson recorded her first career double-double. She finished the evening with 27 points and 10 rebounds to lead the Terriers to a 78-65 win over the reigning champs. ONE: Katherine Haines, GR (SHU): The Pioneer grad student helped lead SHU to a pair of victories this past weekend, recording double-doubles in each game. On Saturday against Wagner, Haines produced 22 points and 13 rebounds before tallying 20 points and 15 rebounds on Monday night against Bryant. Haines came up clutch against the Bulldogs, heading to the charity stripe with nine seconds left and her team trailing by one. She calmly drained both free throws, providing the Pioneers the winning margin. “Each day we work on free throws, that’s all we do at the end of practice,” said Haines in her NEC Front Row post-game interview, “I had the confidence when I got up there and I knew that I was going to knock them down.” Haines has been an integral part in SHU’s early conference season success, standing second in scoring and fifth in rebounding during the first four league games. Four players share the single game scoring record in the “Battle of Brooklyn” series. SFBK’s Kim Bennett in 2005 and Sarah Benedetti ten years later in 2015, as well as LIU’s Valarie Nainima in 2008 and Ashley Palmer in 2012, have each recorded a 25 point game in the rivalry series, en route to picking up Battle of Brooklyn MVP honors. Join us back here at the NEC Overtime! Blog next Wednesday, January 23rd for a feature article on Bryant junior Sydney Holloway and a full recap of Week #3 of conference play in the next WBB “Fast Break” column.